Have you seen a Tamsi or Olive-Backed Sunbird? 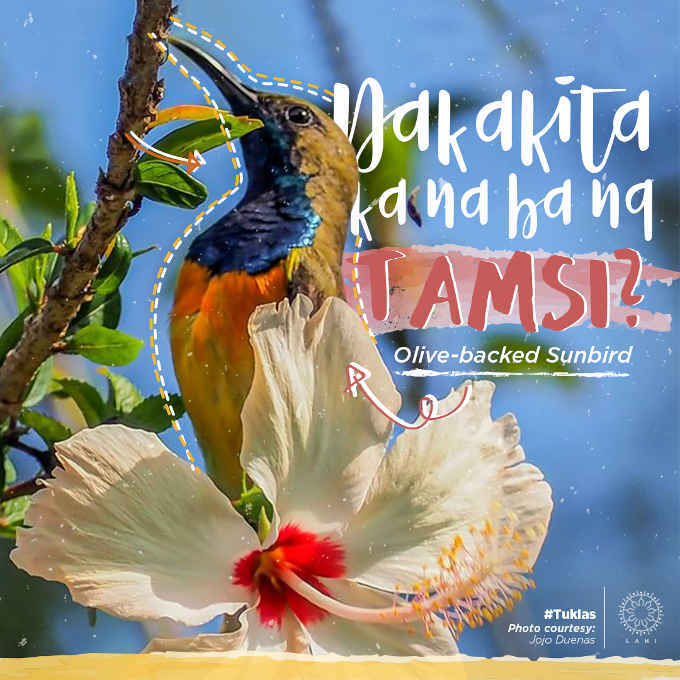 In some parts of the Philippines, Olive-Backed Sunbird is called Pipit-puso and Tseweet. In Malaysia, this bird is called “kelicap”. It is commonly seen in the Metro Manila area, In Baguio City and other parts of the country. Tamsi is a small songbird with a long thin bill and feeds mostly on nectar, and insects when feeding their young. It also loves the juicy fruit of the mulberry tree, and calls out with low whistles while perched on twigs.Sunbirds belong to the Old world passerine birds which are small birds, at most 11 -12 cm long. The males have a diagnostic blue throat and breast, feature missing in the females. They have high-pitched chirps, chatters cheep, cheep, wheet. The most successful member of its family, now found common in densely populated areas, often visiting potted plants, ornamental flowers. Olive-Backed Sunbirds mates between the months of April and August. The birds have adapted well to humans and sometimes build their flask-shaped nest in human dwellings and usually lays 1-2 greenish-blue eggs which takes a week to hatch. Both male and female takes care of the young which leaves the nest about two to three weeks later. They are sometimes mistaken for hummingbirds (which are not represented in Asia).